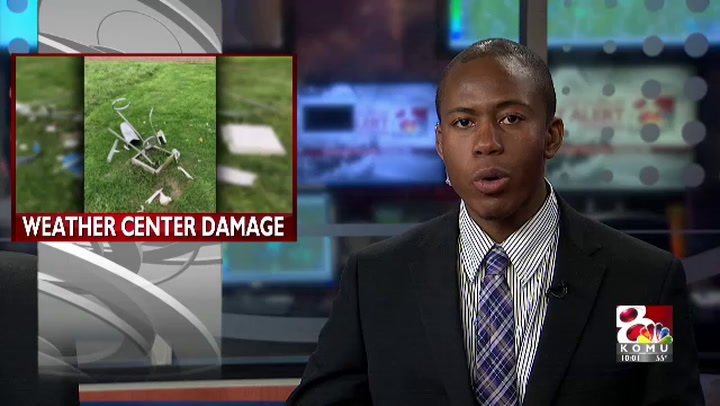 COLUMBIA - The official weather station on MU's Campus at Sanborn Field is “completely destroyed” after a vandalism incident either Saturday night or early Sunday morning, according to MU Extension climatologist Pat Guinan. Guinan said he was the first person who saw “everything was knocked down” when he arrived at the station around 8 a.m. for a routine morning precipitation observation. “When I was driving down Rollins right by Sanborn Field, I could tell something was not right with the station. Pretty much all the parts that were attached to the tripod were destroyed. They were laying all across the ground,” Guinan said. Guinan set up the station back in 1994. After he saw what happened, he said he was “surprised and disheartened.” He said none of the more than 30 weather stations across Missouri have had a vandalism case this bad. “Pretty disconcerting. I’ve been operating weather stations in Missouri for over 25 years, and nothing comes close to the vandalism I witnessed today at Sanborn field,” he said. Guinan said MU’s station keeps track of weather data like rainfall, snowfall, temperatures, wind speed and direction. The station reports daily to the National Weather Service. Guinan said he filed a report with MUPD Sunday morning. He said the scene was cleaned up by the afternoon. Guinan and Lupo said they have no clue who could have committed the acts of vandalism. Andrew Lewis, an MU student, said he lives just across the street from the station. He said he didn’t hear anything suspicious overnight. “Kind of ironic because I was out here with some of our friends probably until like 4 a.m. We were out here pretty late and we had no idea about any of it. I didn’t hear anything or see anything,” he said. Guinan said despite the high cost of damages, his team hopes to reassemble the entire station in the next few days. “Those stations we operate — they are not cheap. They run into the thousands of dollars,” Guinan said. Lupo said insurance could possibly cover the expenses, but if it doesn’t, the team would have to use their own budget money. “It puts stress on our budgets," he said. "At a time when Mizzou is struggling financially, we can’t afford to be replacing instruments because of the vandalism." Guinan said even after the station gets back to normal, it would never be able to regain the data it didn’t record when it was down. “The biggest thing is now we have a data gap. You know, that’s something we haven’t seen in almost 25 years. So that’s unfortunate,” Guinan said. Lupo said he’s thankful the incident would only leave a small gap in the data system, but the station couldn’t afford to be down for a long period of time. Lupo said there are six-to-seven-feet tall fences around the station, but one of the three gates is always unlocked. Guinan and Lupo both said the team will start looking for ways to ramp up security, including installing cameras.